I am not entirely sure how I agreed to do this. 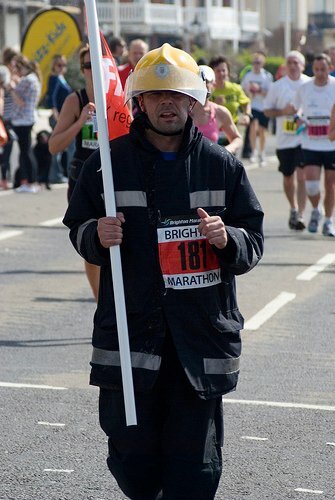 It may have been in a pub or to break an uncomfortable silence, but somehow I agreed to run this marathon with full fireman uniform, if it could be found. It was on behalf of my work colleague Amy who is taking part in a round the world drive in a fire engine to raise money for 3 great causes. She was supposed to be doing the marathon with me but had to pull out injured a few weeks before. It was a shame, because it meant that I had to look like an idiot on my own. The Brighton marathon is the newest and perhaps the most ambitious new race in the UK. The city advertises itself as "London-by-the-Sea" and made it clear that it was aiming at the London "rejects" who grow in number each year. They had 12000 places to sell making it the 2nd biggest marathon in the UK after London. They sold the spaces within a week. Interestingly they were accepting entries on the day for those who had places for Boston and other marathons that people could not get to because of the airspace restrictions caused by a volcanic eruption. It was also forecast to be the hottest day of the year so far in the UK, a tropical 16 degrees. Having emerged from a very cold winter this felt like summer already. 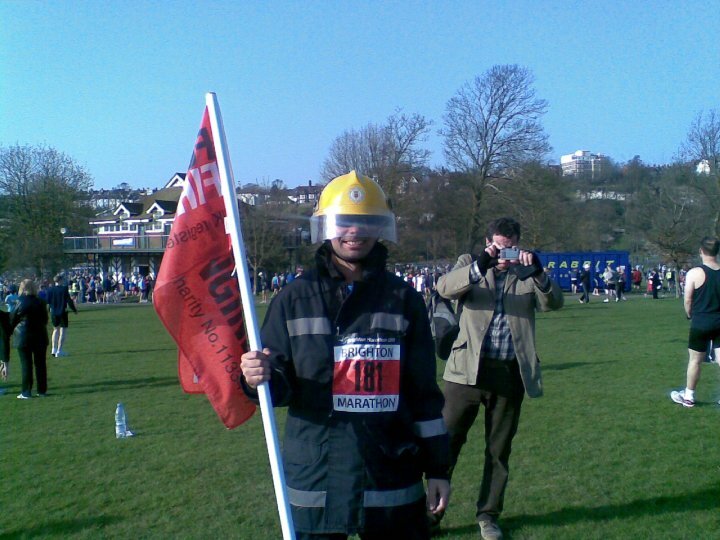 This stupidity was to raise money/awareness for Follow That Fire Engine. Have a look on the website to see the details of this great charity fund raising project. Having put the outfit on I waited at the start which was delayed by around 15 minutes as someone had left a car parked on the route. Those 15 minutes I started to heat up quite a lot. The day had started quite cool and crisp and would have been ideal running conditions for someone in a vest. I was hoping for at least that. However before I had even passed the start line I was getting very bothered by the heat in my suit. I had not tested the outfit at all, such is my blaze attitude to races nowadays. I had merely jumped around the living room to make sure the helmet does not bounce too much. It took about 5 minutes to pass the start line and as soon as I was running I was just relieved that the outfit wasn't too awkward. The start in Preston Park heads through some streets and then before the first mile there is a banner that says you are at the highest point of the route. "All down hill from here" it exclaimed. I was glad when the first mile marker came up and seemed to celebrate it more than usual? How can I be glad after just one mile? There are another 25 to go? That became a them for the next few miles. I did not have a watch on so had no idea how long it was taking me but I was heating up quite uncomfortably and watching out for every mile and sometimes kilometer marker. The first few miles had a few minor inclines that you would notice if you were running but I noticed more as they caused me to sweat and then weigh me down. Despite the really great support from the crowd and other runners I was in a bad way quite early on. I walked through the regular water stops and drank 2 bottles each time. I spent a lot of the time walking and people were passing me constantly. I've never felt so bad so early in a race, around 6 miles in I was walking a lot and wondering how many hours I'll have to suffer this. Amy had arrived and saw me looking in a world of pain after about 7 miles. I thought that if nothing else this would be good training for Badwater where I fully expect to feel tired, sick and lacking energy from the very first steps of the race. At the same time the crowd were still going wild every time I ran past and I was getting fed up with it. I stopped for a piss only once (and that was an excuse to stop for a minute). I was suffering a sense of humour failure such that I would not have appreciated any jokes about me getting my hose out. Not long later we were on a long stretch of promenade. The first few miles I was shielded from any breeze by the runners running in the other direction who were miles ahead of me. Only after around 9 miles did I finally feel some breeze on my face that enabled me to cool down a little. It was only a slight breeze as it was a very still day but it helped. I managed to get into a more consistent run after than and was in a sort of equilibrium where my soaking wet fireman jacket would cool me from the sunshine. The halfway mark of the race is right in the middle of Brighton where the crowds were huge. I felt good at halfway and saw Amy and Steve in the crowd and felt obliged to give Amy a big sweaty hug since it was her fault I was doing this in the first place. I had recovered from the last few miles and felt in a good mood to wave the flag to anyone who would shout at me, which was everyone. I had spent the first half hitting myself in the helmet with the flag pole, now I was waving it around in the air. I felt some strange connection with the others who were in fancy dress, there was a Scooby-doo, a banana, several toilets, a Sponge Bob Square Pants, a Storm Trooper and some army guys. The support I got in the race was unlike anything I had ever experienced. I hated it in Paris the previous week but now I loved been the centre of attention. Cheerleaders would scream, kids would yell "There's a Fireman", and old ladies would comment on how hot I looked. I certainly felt quite hot. I got constant appreciation from fellow runners too, people coming alongside me asking how the hell I was doing what I was doing. Most just wanted to shake my hand, others would just talk about be as if I wasn't there "Seriously why would you go and do that to yourself". At the time I didn't really appreciate the ridiculousness of what I was doing but I did see another fireman a few miles behind me with the full breathing apparatus on his back. A much braver man than me, though I was carrying a big flag. I finished in 4.44, not far off the time I got for my first ever marathon and my second negative split ever. I was a bit disappointed that it was over, I really started to get into it. As soon as I stopped though I cooled right down, I was tempted to sit under the promenade and snooze but I would have frozen. All in all a really good experience. I got some "heat" training done, I had a brilliant time running around looking like an idiot and discovered a brilliant event that is sure to become huge in the British Marathon calendar. Which reminds me, when are Runners World going to update their marathon calendar? I can't stand the ugly bloke who's on it now.